How to hold harmonica? That is problem which many people ask HarmonicaTabs. As many people know: holding a harmonica properly is the first step toward playing it successfully. If you’re a lefty, follow these instructions but reverse the left and right hands. 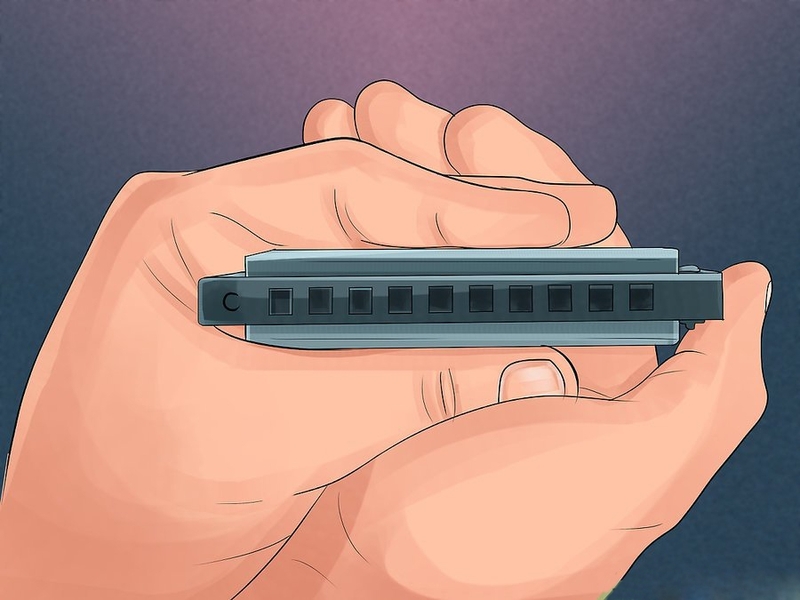 Make sure the harmonica is right-side up: The holes of the harmonica should be facing you, with those that produce the lowest notes on the left and those that produce the highest notes on the right. 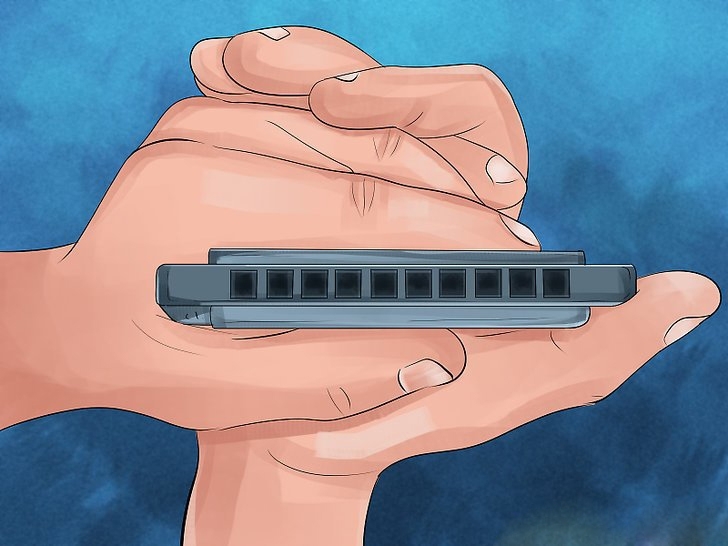 Hold the body of the harmonica in the left hand between the thumb and index finger. The three remaining fingers will then be curved slightly, to form a small resonating space. 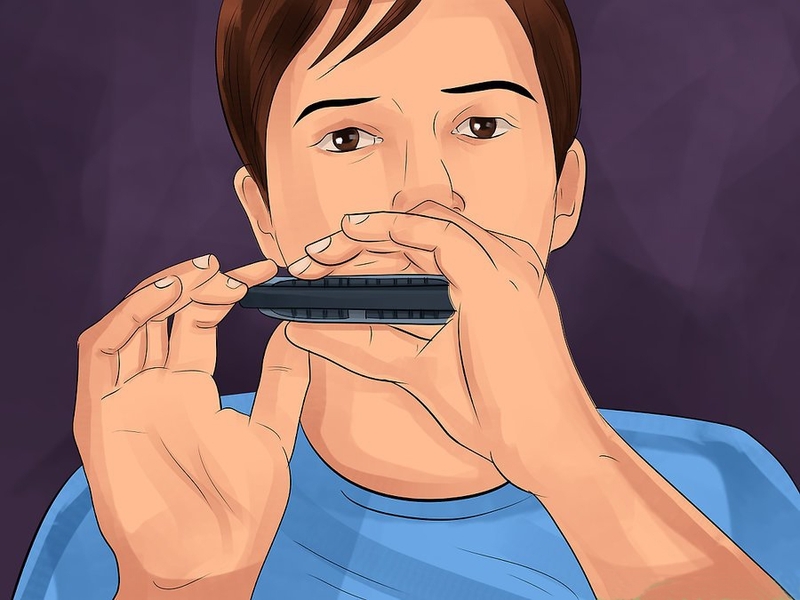 Place the flat of your right hand over the harmonica (not the mouthpiece side! ), and enclose it, forming a tight cup. Optimally, the cup should form a large resonating space. With the left hand, hold the harmonica somewhere around the left of the center. 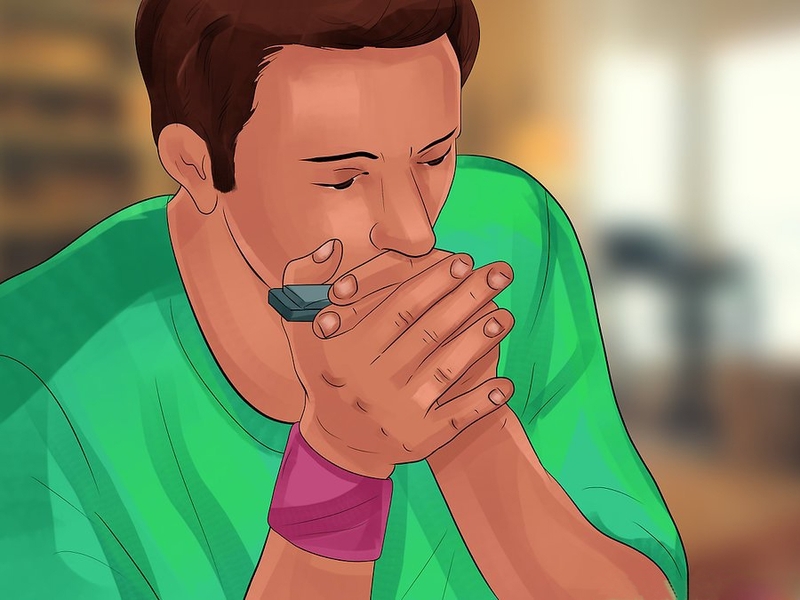 If one has the strength, hold the harmonica with the thumb and index finger, and let the three remaining fingers curl together to form a resonating space. With the right hand, hold the harmonica somewhere around the right of the center. If one has the strength, hold the harmonica with the thumb and index finger, and let the three remaining fingers curl together to form a resonating space. The fingertips of both hands should touch each other, while the palms face each other. Some players also recommended crossing the fingers to ensure a good resonation is formed, but this may hinder the movement of the harmonica. There are quite a few variants for holding a chromatic. One is a deviation of the diatonic hold, using the right thumb to work the slide button. This is particularly used by Blues player, which often play Chromatic in 3rd position only. The other popular variant is very similar: With the left hand, hold the harmonica somewhere around the left of the center with the thumb, index and middle fingers. Then twist your right hand along the wrist, so that the fingers point to a two o’clock position and palm facing up. 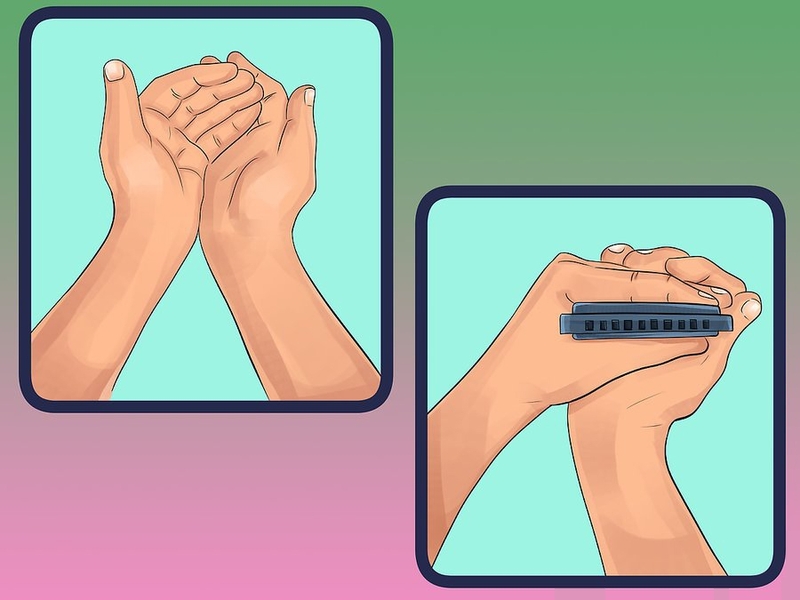 Place the right palm at the bottom of the harmonica (usually sit right below the left thumb) and wrap all the fingers except the index fingers around the harmonica. If done properly, the right wrist will form a right angle. Your index finger will be touching the slide button, and will always be touching there, regardless if you use the button or not. If it’s a 16-hole variant, hold it in similar manner, except your cup will be located closer to the center. Alternatively, break up the cup. 2 Step 2. Position the instrument so its lowest note is on the left. 3 Step 3. Leave the lip of the harmonica exposed. 4 Step 4. 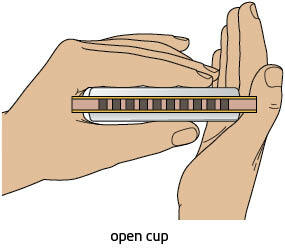 Cup your right hand around the harmonica to create an air seal. 5 Step 5. Place your right thumb in front of the harmonica for control or comfort.
. Hold your thumb and index finger parallel as if you were about to pinch something. Place the harmonica between the two fingers, pushing the left end inside your purlicue (the skin between the pointer finger and thumb). Step 2. Position the instrument so its lowest note is on the left. 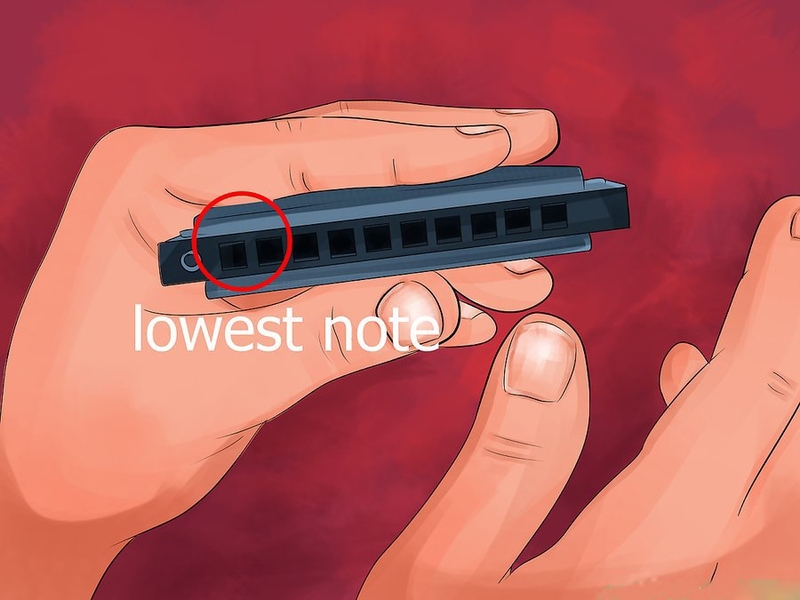 To properly play a harmonica, make sure its lowest note is on your left side. If the notes are not engraved on the instrument’s cover plate, blow on both ends to find which side is lower. Step 3. Leave the lip of the harmonica exposed. 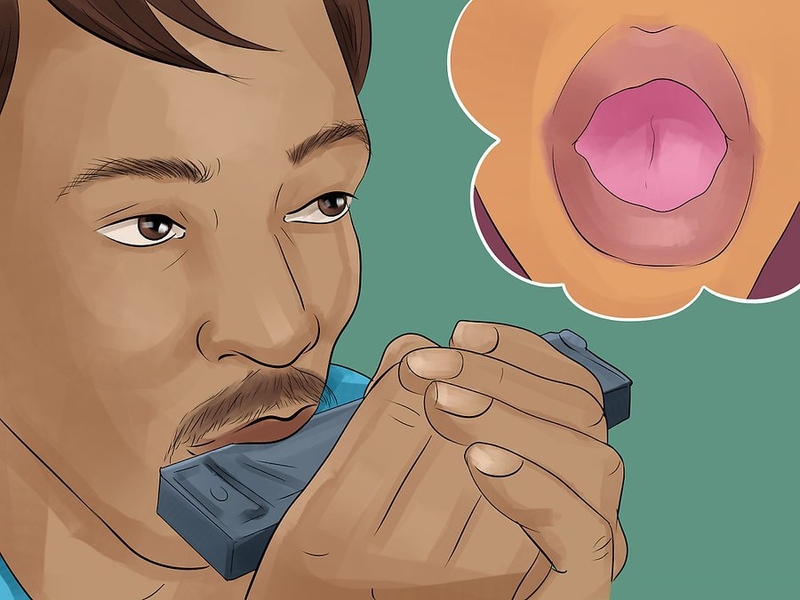 To leave room for your mouth, make sure about half the harmonica is exposed. When blowing, keep your thumb and index finger back so you do not have trouble connecting with the instrument. Step 4. 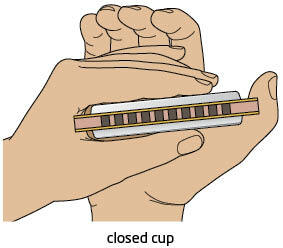 Cup your right hand around the harmonica to create an air seal. Make sure to close large and noticeable gaps, especially at the back of your hands and around the harmonica itself. There is no way to make a complete seal using your hands, so don’t worry about tiny gaps. Step 5. 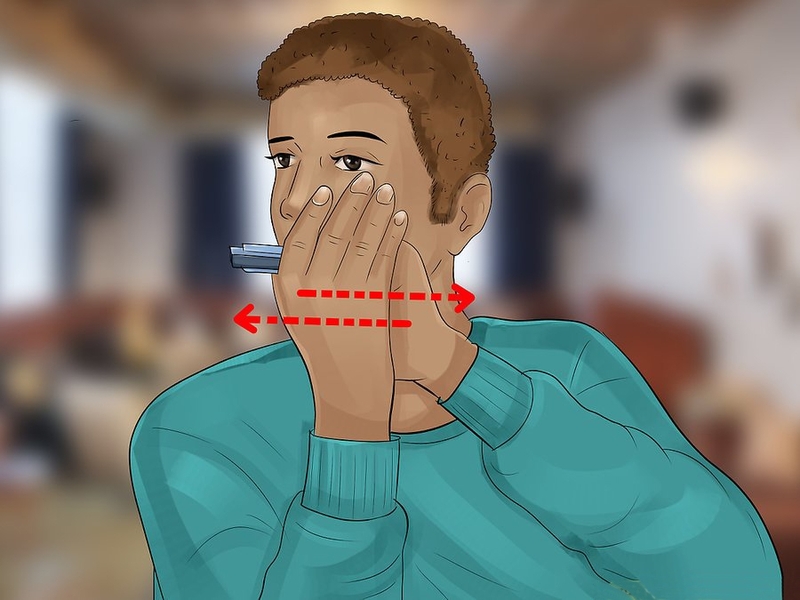 Place your right thumb in front of the harmonica for control or comfort. When playing, make sure to hold your right elbow flush against your side. This will help prevent arm, shoulder, and neck strain, as well as give you greater control over your hand techniques. To change from one note to another, slide the harmonica right or left in your mouth. Most harmonicas will have between 10 and 16 notes to create sound, though specialty harps may have more. Most consumer harmonicas are locked to one key with note variations made by changing how you blow. To play higher, brighter-sounding notes, open your hands to let more air escape. Instead of sad, muted tones, this will give you the bright, bouncy ones used throughout folk music. Behind the harmonica, done by slightly twisting your right hand. 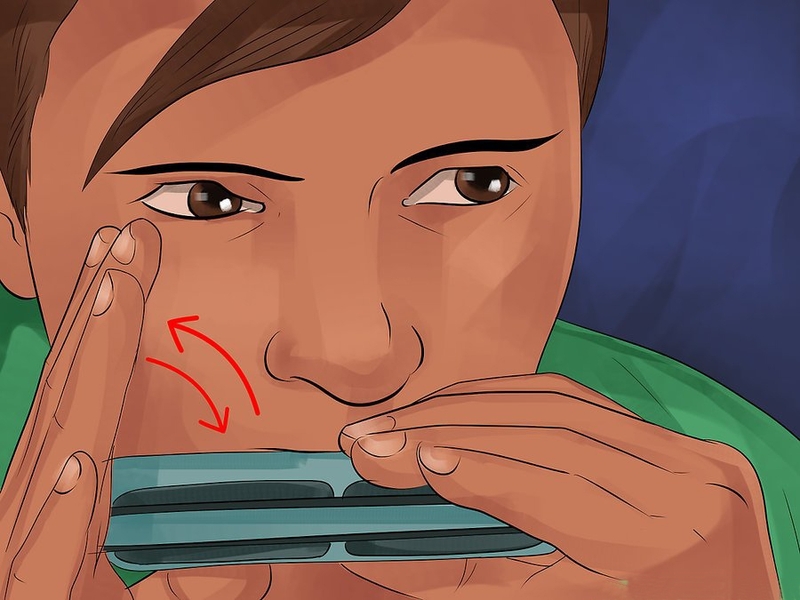 On top of the harmonica, done by extending the fingers on your right hand. 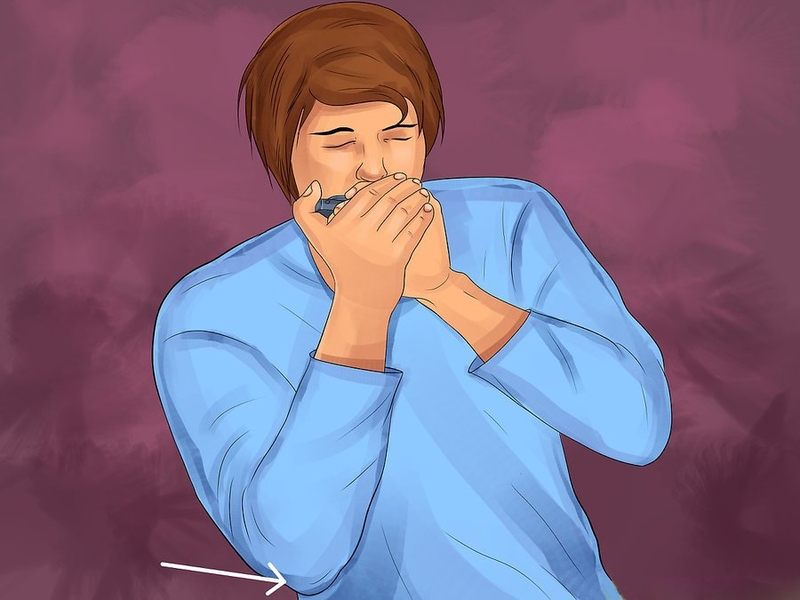 Below the harmonica, done by bottoming out your right wrist.